Everyone loves a parade, and the Queen’s Parade brings a touch of life from times gone by. People line the streets of downtown Cambridge for the Dickens Victorian Village’s second annual Queen’s Parade on Nov. 8. The parade, in honor of elegant Queen Victoria, will head down Wheeling Avenue at 1:00, as a touch of royalty enters the streets of Cambridge. The Queen will be accompanied by Gerald Dickens, great-great grandson of Charles Dickens. Step back to a time before motorized vehicles, as many entertaining groups, too numerous to list, either walk, ride horseback, or are driven in carriages. Among those walking are members of the Cambridge Social Dance Club, who have been a part of the annual celebrations for several years. 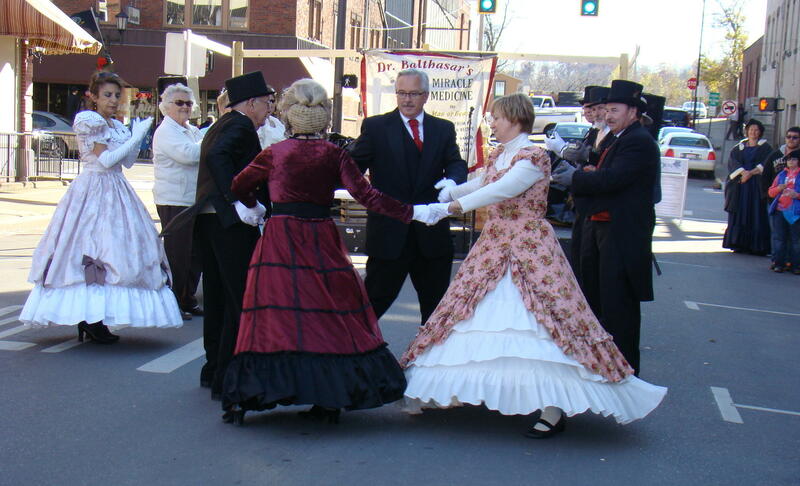 See them dance their way down the street as well as perform at the Victorian Street Fair on E. 8th Street. They’re just getting warmed up for Mr. Fezziwig’s Ball next weekend. Local dance studio students parade down Wheeling Avenue as street sweepers, who were needed in the time of Charles Dickens. The newly formed band at East Guernsey Schools will be making an appearance and perhaps a portion of the ever popular Cambridge City Band will perform for this occasion as an old-fashioned Clown Band. 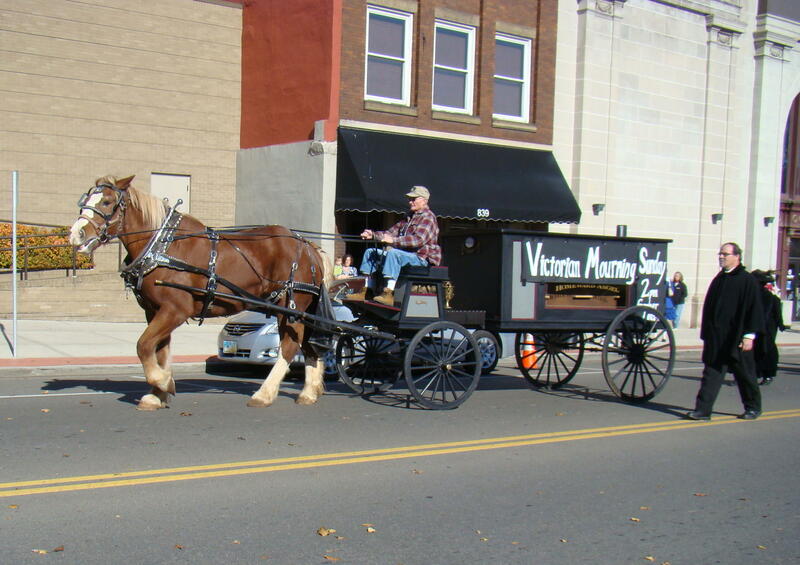 A procession of mourners follow the horse-drawn hearse as they head to the “Victorian Funeral Experience”, which will be held the following day, Sunday, Nov. 8th at 1:00 at the Gross Mansion. The Medicine Man, Dr.Thelonious Balthazar, rides in a carriage at the parade. The Medicine Man will actually have two shows on Saturday at the Victorian Street Fair. The first show is at 11:00 before the parade, while the second performance will be at 4:00 in the afternoon. You won’t want to miss his words of medical advice! Participants in “Whiskers Wars” also walk in the parade. Come out and encourage these manly men, as they have been grooming their beards all summer long. Several categories exist for beard entries and judging will be held at the Dickens Street Fair on the steps of the bank. Most entrants dress in costumes of the Dickens era, so show your Victorian spirit and cheer for your favorite contestant. The sounds of the Akron Bagpipe Band announce the arrival of Queen Victoria’s elegant, horse-drawn carriage. Then the Queen heads to the Victorian Street Fair where she oversees activities for the remainder of the afternoon. 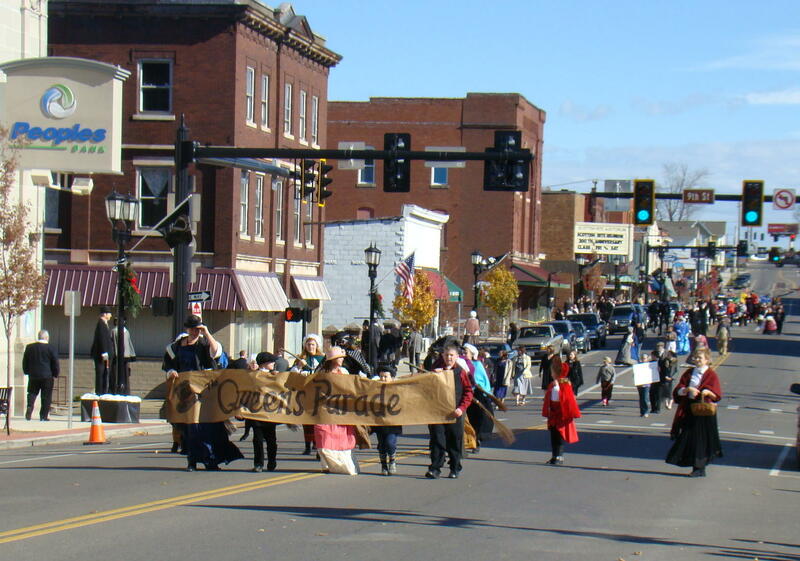 However, the parade is just a small portion of the excitement for “Queen Victoria Weekend”, the second themed weekend of the Dickens Victorian Village season. If you would like to learn about additional activities, visit their website at http://www.DickensVictorianVillage.com or call 1-800-933-5480. Dickens Victorian Village takes place from November through mid-January each year when Historic Downtown Cambridge comes to life with 92 scenes of 166 life-like figures representing classic scenes from Victorian society. To add to the festive atmosphere, each evening from 5:30-9:00, the magnificent 1881 Guernsey County Courthouse Music & Light Show pulsates to holiday music with synchronized lights. Dickens Victorian Village is located in Downtown Cambridge, Ohio near the crossroads of I-70 and I-77. Take any Cambridge exit and you are sure to find yourself on Route 40, which heads straight through Downtown Cambridge. Thanks for the info! 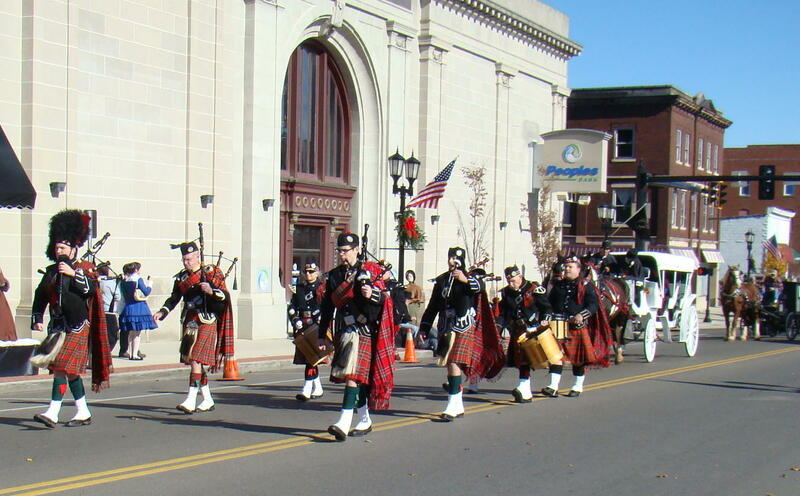 I just heard about the parade a couple days ago and can’t wait to go, especially to hear the bagpipes! I may have to check out the street fair, also. Since I enjoy exploring, this is a perfect way to share my adventures. Thanks for checking out my Gypsy Road Trip. What a unique and lovely idea!! We have such fun here during our Dickens Victorian Village year after year. Busloads arrive to enjoy all the activities and warm hometown hospitalitiy.